Next stop...The Magic School Bus heads to the Galapagos to learn about invasive species! Arnold is alarmed to discover that the beloved Ms. Frizzle has been promoted and her younger sister Fiona is taking over the class. His worries come true when a simple field trip results in the Galapagos Islands being overrun by invasive bunnies. Can Arnold save the islands, and will he ever learn to like his new teacher? Not All Change is Bad! When Ms. Frizzle gets a job as a professor, her sister takes over her class as the new teacher. Arnold doesn't like change and that includes the new Ms. Frizzle. He especially doesn't like her plant sitting on the desk, so he puts it in his backpack. Ms. Frizzle takes them on an adventure to Galapagos island and teaches about ecosystems and invasive species. Arnold is worried the new Ms. Frizzle is an invasive species and will ruin the classroom. In an attempt to set things right, Arnold leaves Ms. Frizzle's plant on the island, but he has no clue what trouble it brings. 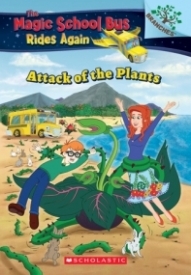 Soon, it's up to Ms. Frizzle and the class to save Galapagos Island from an invasive plant! I love how this book teaches that not all change is bad. Arnold learns the hard way, but Ms. Frizzle takes it all in stride. It also teaches the science behind plants and the balance of ecosystems. There's also a glossary in the back for unfamiliar terms. Final Verdict: This book is perfect for fans of science, plants, nature, and those going through change.